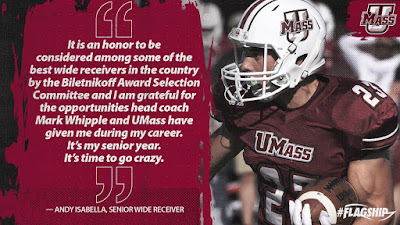 Andy Isabella has been named to the Biletnikoff Award Watch List. Mike Traini of "Fight Massachusetts also has a post on Isabella being named to the Biletnikoff Watch list. The Minutemen wide receiver corps should be talented and deep. UMass out gained the opposition in receiving by 90 yards a game in 2017. The Boston Herald says BC's offense will be ready to roll in 2018. Watch out for silky- touchdown waiting to happen!